US equities are increasingly weak, lead lower by the 'old leader' - Transports, which has seen net monthly declines for the past 6 of 9 months. Underlying momentum is ticking lower in all indexes, and regardless of any strength into August, the market looks particularly vulnerable in Sept/October. 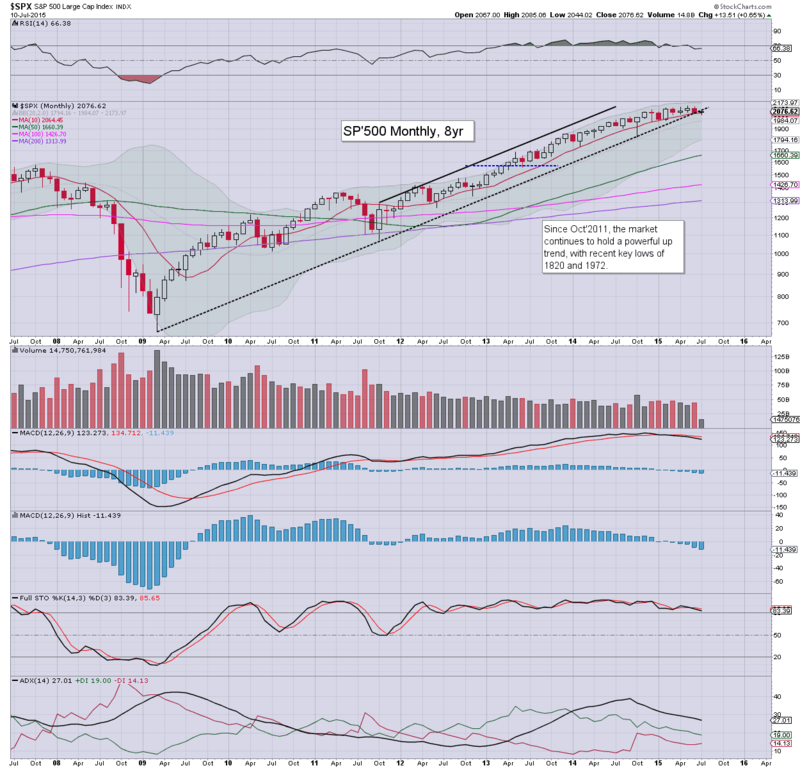 Despite all the wild swings, the sp'500 effectively closed the week u/c at 2076. 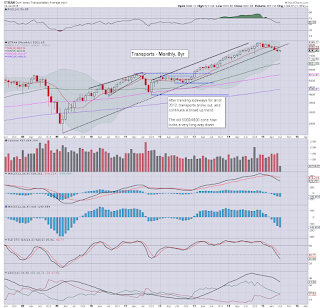 There is an increasingly secure double floor of 2044, and it would seem the 2100s will be hit in the near term. Underlying MACD (blue bar histogram) cycle ticked lower for the fifth consecutive month, and is now at levels not seen since June 2009. Unquestionably... price momentum is increasingly favouring the bears with each passing month. The most reasonable downside scenario is a break <2K after mid August, levelling out somewhere in the mid/low 1900s by early October. The lower monthly bol' - currently around 1800, looks out of range. The most bullish scenario is a straight up run to the upper monthly bollinger, in the 2160/80 zone, with subsequent downside to the 1950/00 zone. Such upside will not be easy though, as many world markets have already maxed out across the last few months. 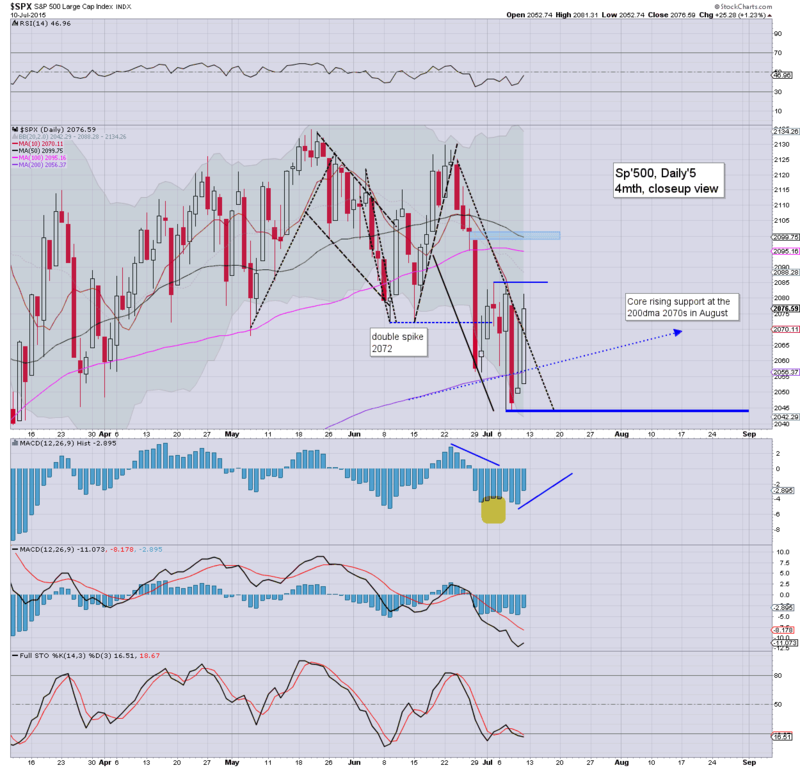 Best guess... upside into August.. 2110/20s... and then renewed weakness in Sept/early October. 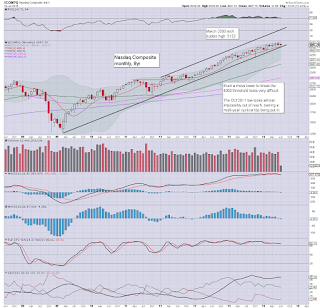 The giant 2K threshold looks very vulnerable.. with a realistic down wave to the 1950/00 zone. Sustained action in the 1800s looks very difficult, not least as QE continues, along with share buybacks, and broadly low int' rates. 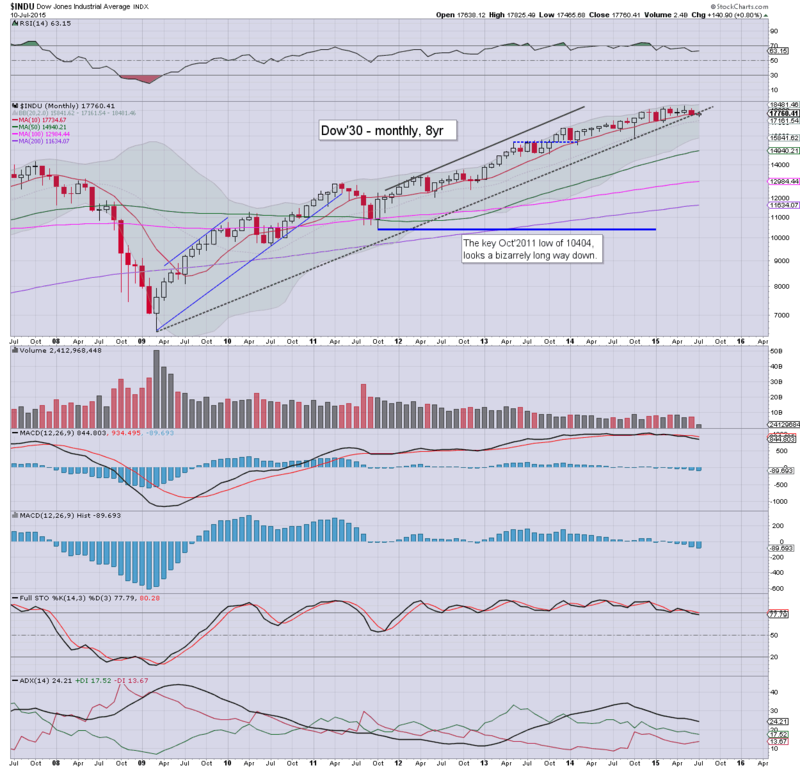 The tech remains very close to the recent historic high of 5164. 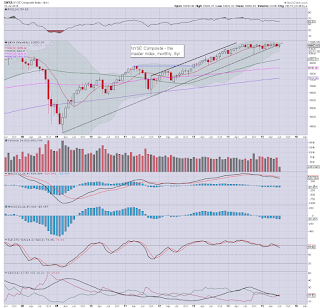 First support is the rising 10MA @ 4865, with rising trend around 4800. 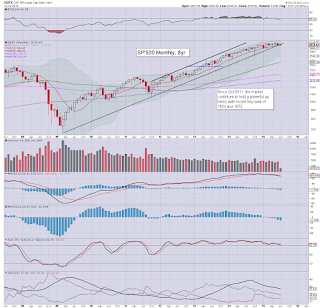 A failure to hold the 4800s.. whether in August or Sept', will offer a washout, probably to the 4300/4100 zone. On no outlook does sustained action under 4K look viable. The mighty Dow - much like the Transports, has been broadly stuck since last November, although with a marginal new historic high of 18351. 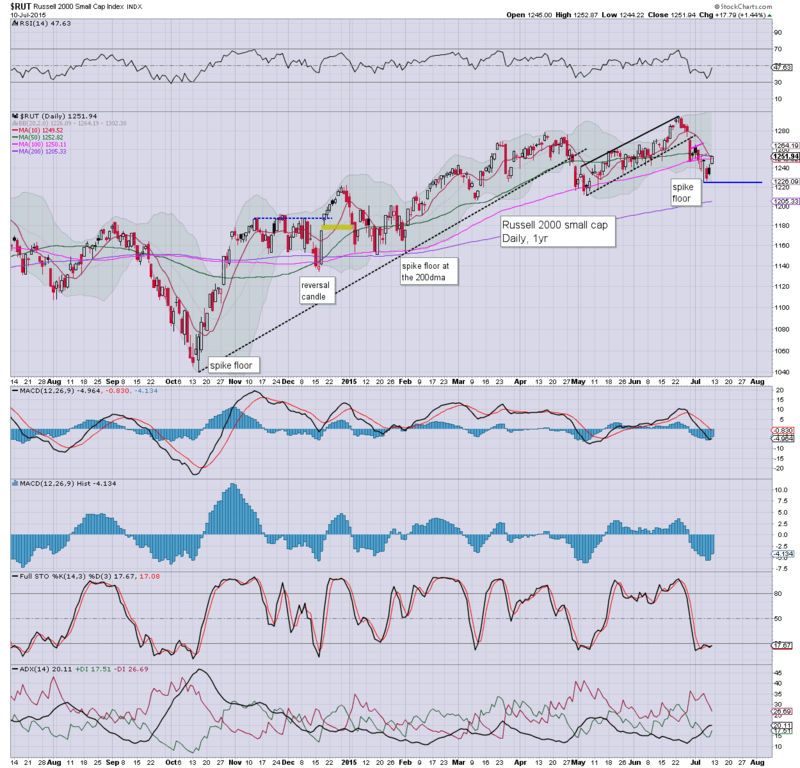 Key rising trend has been broken, and the Dow is looking increasingly tired. Underlying MACD cycle is the lowest since July 2009, and with a bearish monthly cross, momentum is swinging toward the equity bears. 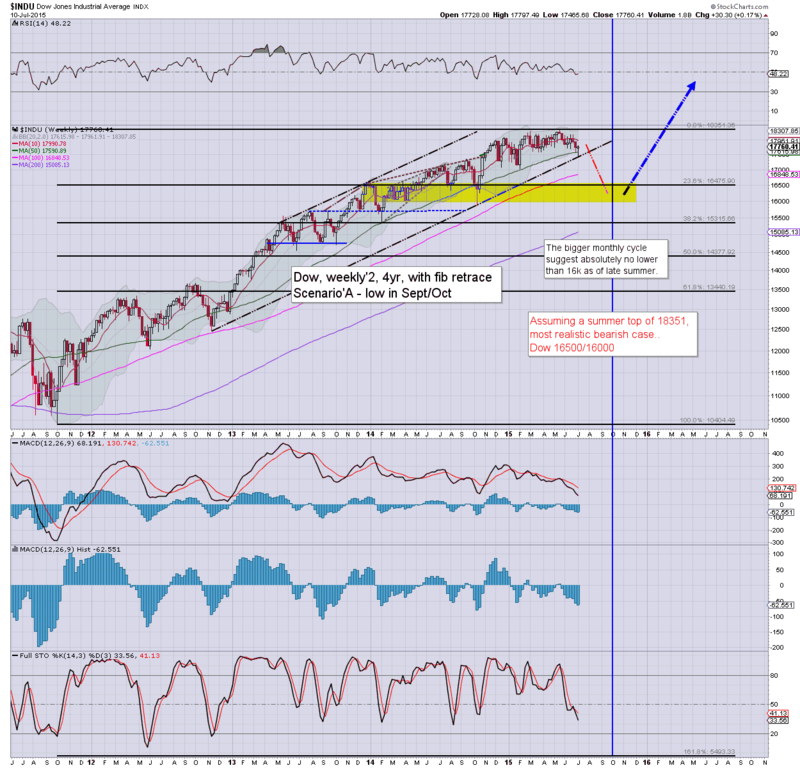 Key downside target remains the 16500/000 zone. 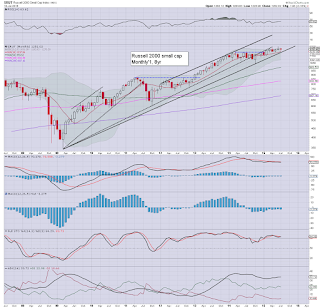 At best, equity bulls might hit the 18400/600 zone in August, but really, that looks a major stretch, even if other world markets can also push upward. The master index has been broadly stuck since last June - when energy prices maxed out. 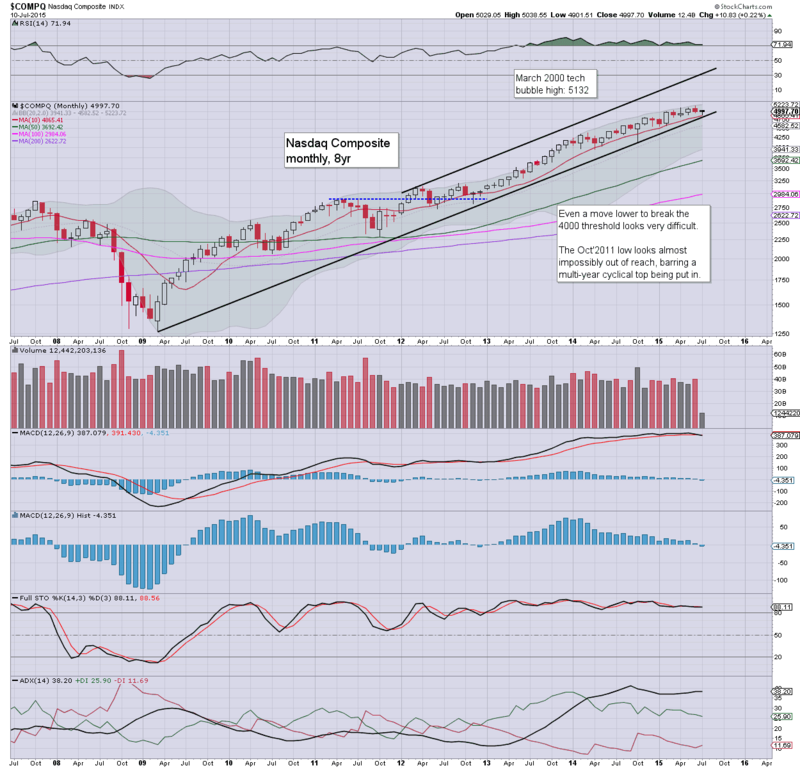 The bollinger bands on the NYSE comp' are notably tight.. in the 11200/10200s. Sustained action <10K will therefore be particularly difficult, and is suggestive that any weakness in the market will be limited to around 10%. 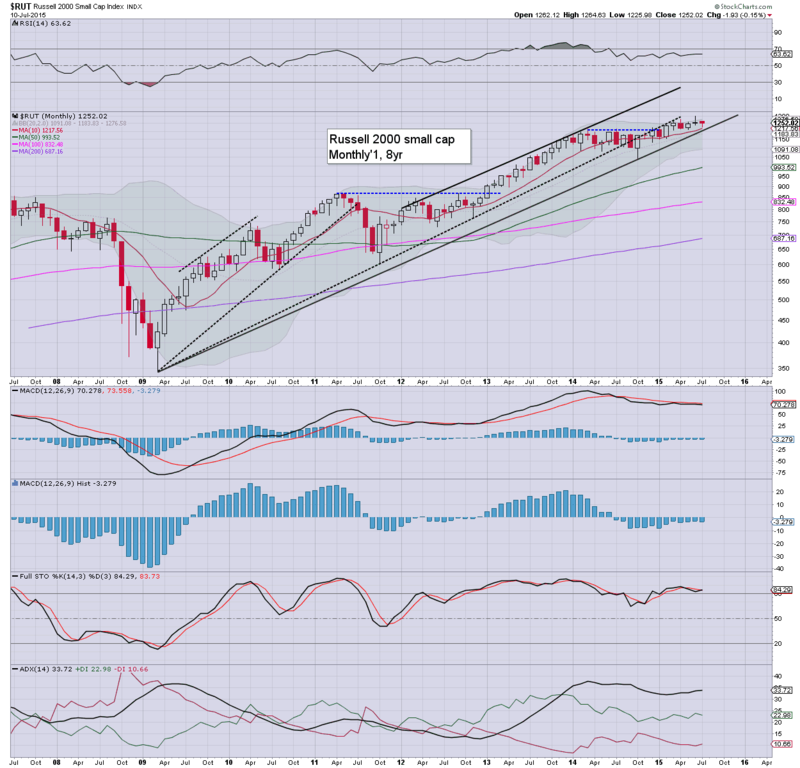 The second market leader - the R2K, remains close to historic highs. First support is the 1200 threshold. Sustained action <1100 will be difficult. 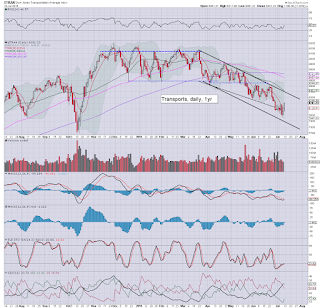 The Oct'2014 low of 1040 looks out of range. 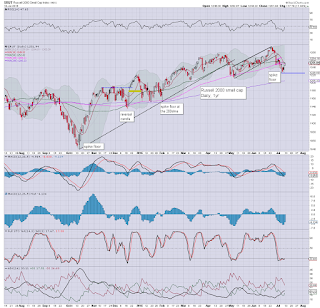 The 'old leader' remains broadly weak, having broken a new cycle low of 7970. 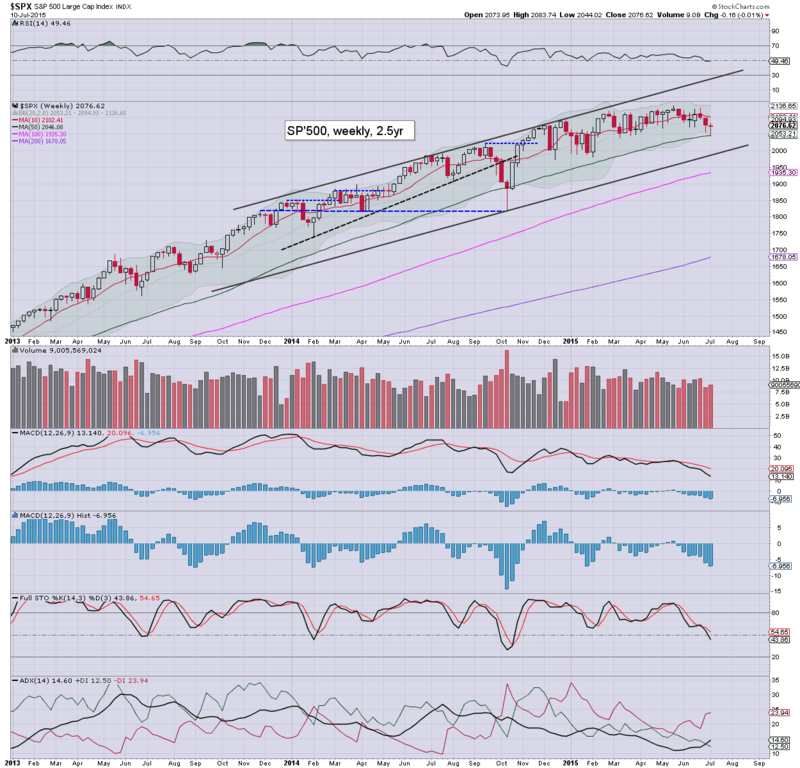 It would seem the Oct'2014 low of 7700 will be hit. If that fails to hold, next target will be 7100/000... but that will be difficult, with the Trans' already having significantly cooled from the Nov' high of 9310. Taken as a collective, the US equity market is looking increasingly tired. Price action for most indexes is still close to recent historic highs, but regardless of any upside into August, the market should see increasingly powerful downside in Sept'/early October. 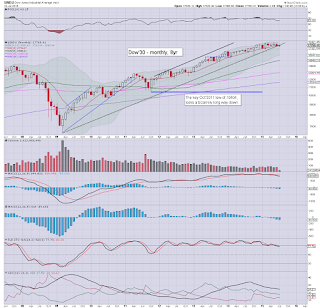 The following chart for the Dow should clarify what I am seeking, and it applies to all other indexes. I realise a fair few out there are seeking a multi-year top in the near term, but that still seems unlikely.. particularly for the US market. I remain of the belief that there is a viable two more years in the current cycle, with Sept/Oct' likely seeing a low... and then upside into 2016.. and beyond. World capital markets will be awaiting further news about a Greek deal, no doubt there will be sporadic headlines across the week. Aside from Greece, the coming week will be mostly about the Yellen, who is due to address the US congress/senate this Wed/Thursday morning. Clown finance TV will certainly give the event blanket coverage. M - US treasury budget. Ohh, and lets not forget there will be an increasing number of corp' earnings... I would imagine most of those will come in at least 'reasonable'. With equities managing to hold significant gains, the sp'500 saw a fractional net weekly decline of -0.2pts @ 2076. Understandably, many of the equity bears are once again starting to get really annoyed and frustrated, as the declines are still not being sustained. 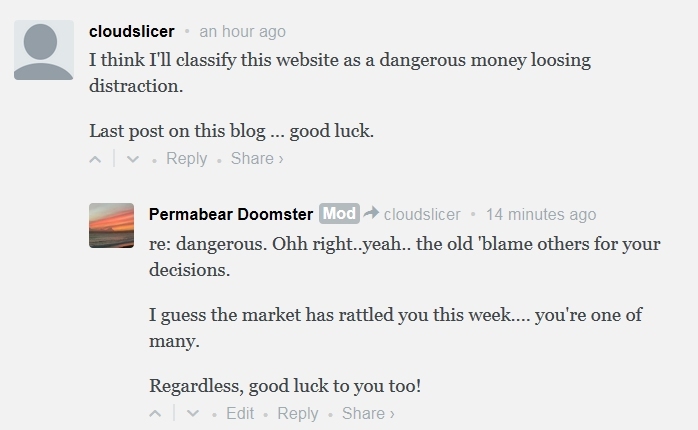 First, I'm not saying cloudslicer is one of the usual sporadic trolls. Far from it... CS had posted for some months to me. Yet.. the sentiment is important to consider. 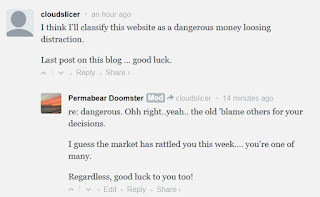 One aspect is of the blame.. and cloudslicer has surely been rattled by the intraday swings this week... as I myself have been. Who hasn't been dizzy this week? A distraction? Well, I guess anything in life could be called that. 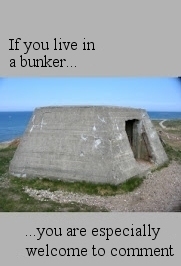 Dangerous? Any financial chatter on any site - whether CNBC/Bloomberg, or a tiny blog like mine, could be seen as a problem, to those buying/selling on margin, with low/zero risk management skills. Money loosing? Well, my posts remain free in the public domain, so.. no one can demand a 'FULL refund'. 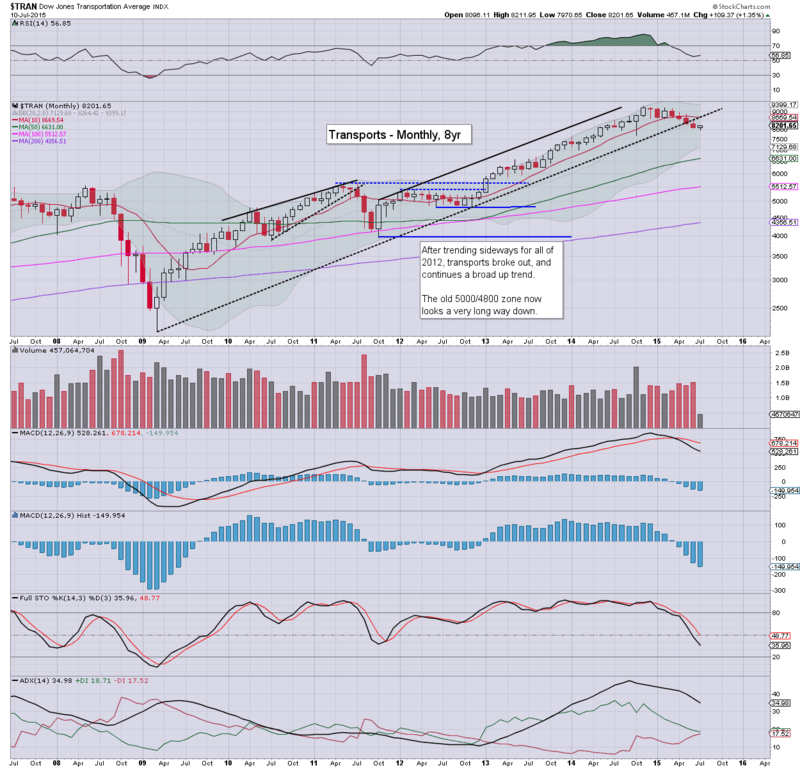 Since the US market broke the double top of 2000/2007 in summer 2013, I waved the giant white flag. Indeed, at the time, I stated on a number of message boards... 'we ain't likely going under sp'1500 EVER again'. At the time, amongst many things I was called.. 'crazy' was a particularly popular one. 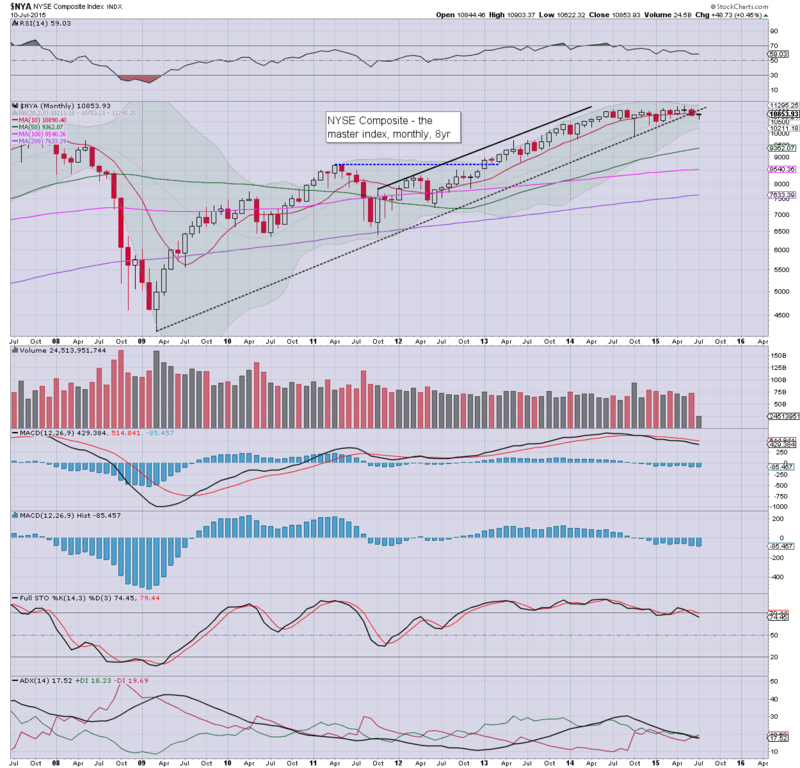 After all, the sp'500 would never go to 2K... no.. it was just an 'overthrow', right? I still don't get how even today, most of the more popular chartists don't ever reflect on the huge implications of the multi-decade breakout that happened in summer 2013. 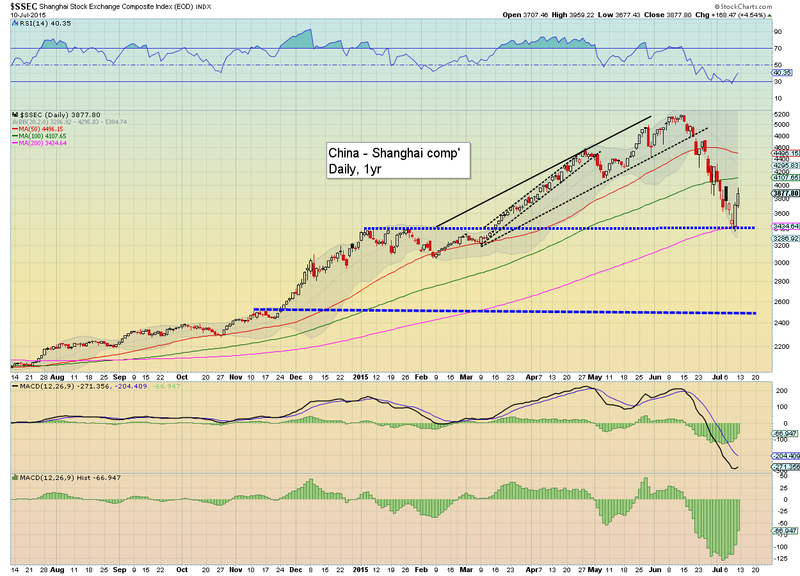 With the Shanghai comp' breaking 2500 in November 2014, the next natural level was the high in late 2009... the 3400s. That was quickly achieved in January. From there... I called for 5K by late 2015. 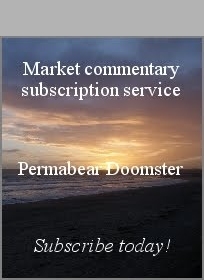 Yeah... more crazy bullish talk from the Permabear... even some banker on CNBC-Asia laughed (them having highlighted one of my tweets) at such an 'overly optimistic' upside target. 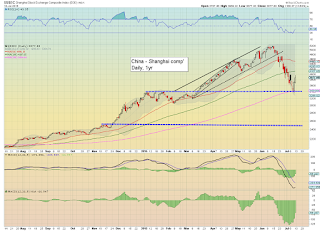 A mere 5 months later - this past June, the SSEC hit 5K. From there, I called for a 'natural retrace' to the 3400s..... again... more laughter.... a mere 3 weeks later... the 3400s were hit. I relentlessly endeavour to provide as balanced an outlook as I can, but I realise for some of you... its just never going to be enough. 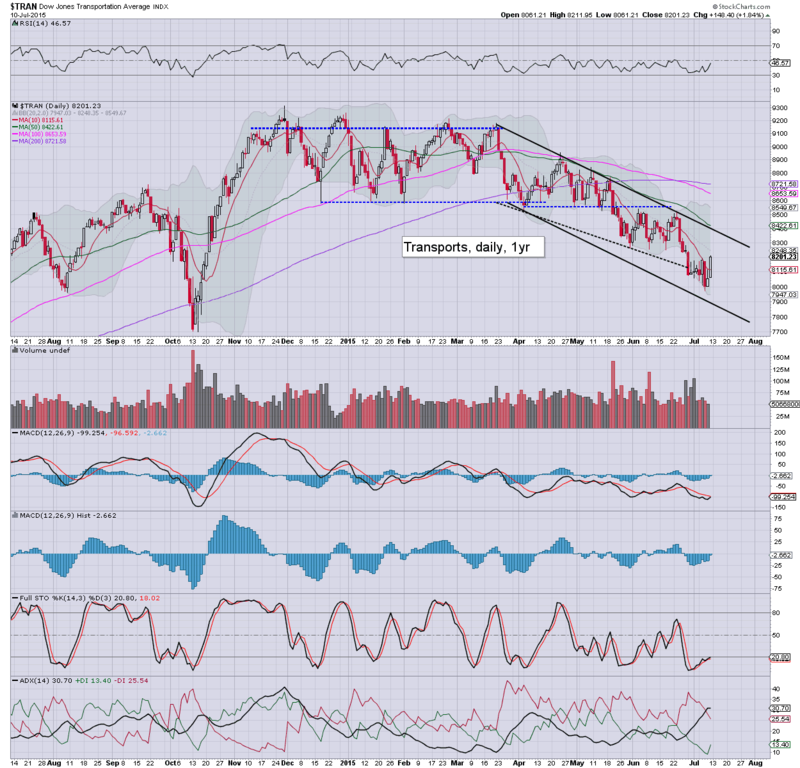 The market laggard - Transports, looks set to battle upward into the 8500/600s. 9K looks out of range, no matter how strong the market might be in first half of August. 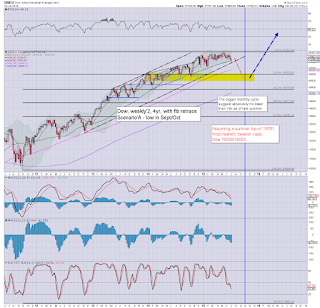 Sp'500 looks set for the 2110/20s... whether it can break new historic highs next month... difficult to say.